The first thing that one notices when visiting the Town Hall Theatre in Lafayette is just how cozy it is. I can’t think of a more perfect environment in which to see their uneven, but overall very agreeable production of Mary Chase’s sentimental Pulitzer-prize winning play “Harvey.” The play concerns the uppity Mrs. Simmons, and her difficult attempts to reason with her brother Elwood, who claims to see a six-foot-tall white rabbit with whom he has developed a close friendship. Complications include mishaps with a psychological ward where Mrs. Simmons attempts to have Elwood interned for his delusions. The play serves mostly as an appropriately zany farce, but unexpectedly hits the audience with its poignant message about kindness in addition to its subtly acrid takedown of the American method of dealing with the psychologically troubled. It’s wonderfully funny and gives the audience much food for thought. The production at the Town Hall Theatre, first and foremost, is admirable. The company clearly holds an immense reverence and respect for the text given to them, and wisely aim to present the material with simplicity and clear-headedness. It is staged with economical intelligence by Susan Hovey, and agreeably designed by Brian Watson (sets) and Hope Birdwell (costumes), who give the 1940s piece a necessary flavor of vintage authenticity and charm.. The casting is uneven. Thankfully, the two staple roles of Elwood and Mrs. Simmons are very well performed by Steve Rhyne and Laurie Strawn. Ms. Strawn displays excellent comedic timing, and is just batty enough that her first meeting with a psychologist, wearing a slightly vitriolic façade, remains completely believable. Most of the laughs come directly from her character, and any time she is on stage the play is very funny indeed. Mr. Rhyne plays Elwood with a remarkable amount of subtlety and gentleness. Even if the character of Elwood weren’t so well-written, Rhyne’s presence onstage draws forth an enormous amount of sympathy from the audience simply by means of his calm and careful mannerisms. The supporting cast is game, but less capable, with some actors appearing awkward or clumsy onstage. And there is a tendency by some supporting players to ham it up, as though intent upon stealing attention from the two lead performances. Problems aside, Harvey is still a wonderful treat for the holidays. The play itself is worthy of being seen far more often than it is performed. Town Hall’s production is very enjoyable despite any flaws, and I would definitely recommend seeing this. It will certainly put you in the Christmas spirit. 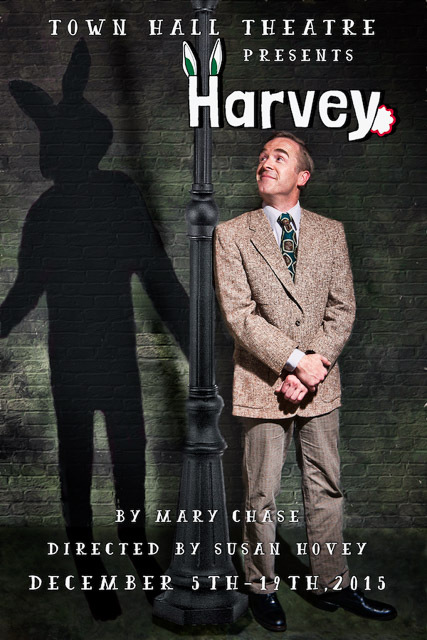 “Harvey” plays at the Town Hall Theatre in Lafayette through December 19th, 2015. For further information click here. “Harvey” by Mary Chase, produced by Town Hall Theatre Company. Director: Susan Hovey. Costume Designer: Hope Birdwell. Scenic Designer: Brian Watson. Lighting Designer: David Lam. Stage Manager: Amanda Boyan. Scenic Painter/Props Artisan: Justin DuPuis. Assistant Stage Manager: Rachel Gephart. Master Carpenter/Technical Director: Henry Perkins. Elwood: Steve Rhyne. Veta: Laurie Strawn. Miss Kelly: Emily Garcia. E.J. Lofgren: Bill Dietz. Dr. Chumley: John Blytt. Wilson: Michael Bishop. Mrs. Chumley: Sally Hogarty. Myrtle Mae: Nikki Nickerson. Aunt Ethel: Briel Pomerantz. Dr. Sanderson: Damien Seperi. Judge Gaffney: Chris Westphal. Posted in Reviews.Tagged Charles Kruger, Harvey, Laurie Strawn, Mark Johnson, Mary Chase, San Francisco Theatre Reviews, Steve Rhyne, Susan Hovey, theatrestorm, Town Hall Theatre Company.